Thought that we would let you know about something that we are really excited about. These kids have really done a great job. 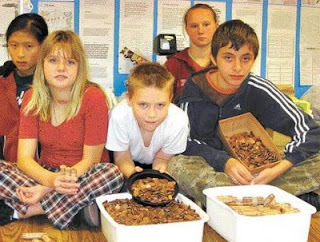 The students and staff of Hillcrest Public school in Cambridge have been industriously wrapping pennies these past two weeks. Kindergarten girls and boys bringing in sticky handfuls of pennies; older students generously providing from their piggybanks, sometimes enough to provide a whole bedkit. Working together, four hundred Canadian children have raised enough donations to provide forty-three bedkits. 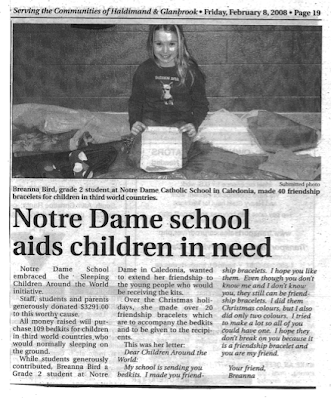 The opportunity to help other children really seems to have touched a chord with these young people, their parents, and teachers. Their enthusiasm and generosity have overwhelmed us. Christmas and Sleeping Children make an excellent match. Hope that you have a very Merry Christmas. 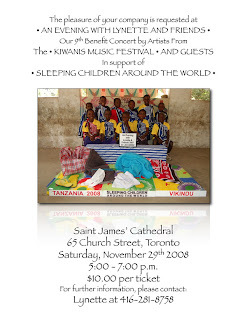 CharityVillage founder, Doug Jamieson, and his wife Pat have donated to Sleeping Children Around the World (SCAW) for several years now. SCAW donations provide bedkits to children in underdeveloped and developing countries. 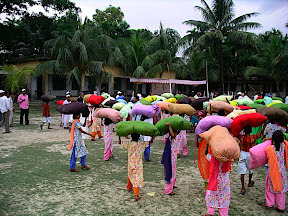 Bedkit items are specific to each country, but typically consist of a mat or mattress, pillow, sheet, blanket, mosquito net (if applicable), new clothes, towel, footwear, and school supplies. 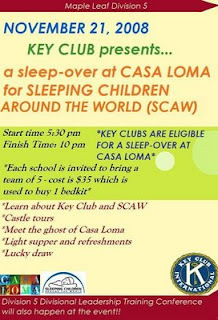 SCAW is a volunteer-driven organization and every dollar donated goes to purchase the bedkits. All administrative costs, including salary for their one employee, are covered by an endowment set up by founder Murray Dryden (father of Ken and Dave Dryden). This October, however, Doug Jamieson took things one step further and traveled to Bangladesh to help distribute 8,000 of these bedkits. Says Doug, "My wife and I have donated because we like the idea behind the cause - that a good night's sleep is essential for a child's health and ability to learn at school. I decided it was time to see this work up close for myself." Like all SCAW volunteers, Doug covered his own travel and accommodation expenses. In addition, he did some fundraising with his CharityVillage teammates, friends, relatives and neighbours. The response was fantastic and totalled enough money to purchase 300 bedkits. During the two weeks in Bangladesh, Doug and his five Canadian teammates worked with volunteers from the Rotary Club and Lions Club in Dhaka. After the children donned their new outfits and had their photos taken in front of sample bedkits with plaques bearing donor’s names, they moved on to where Doug was stationed. It was Doug who had the joy of handing out the bedkits to each child. He says he enjoyed the assignment immensely because he got to see the smiles on the children’s faces when they got their hands on their very own bedkit! While Doug and the team worked in a cordoned off area, hundreds of people milled around and watched intently. "This is a very big event - possibly the biggest thing in living memory in some places where the distribution happened," he explains. "It seemed to me that life stopped for a while and everyone converged on the distribution site. People wanted to know what was going on and be a part of it." "It seemed to me that life stopped for a while and everyone converged on the distribution site. People wanted to know what was going on and be a part of it." On the largest distribution day, 1,300 bed kits were distributed and it took seven hours and an overnight steamer trip there and back again. Doug admits that it was pretty intense and tiring work (with only one day off), plus lengthy travel that was often over rough roads. Despite the bumpy ride, travel time provided a great opportunity to chat with team members and reflect on the experiences. How do you put it all into words? "Unless you've seen it," remarks Doug, "it's hard to convey the pervasiveness of the poverty and the spirit of the people. To our eyes, there seems to be a kind of disconnect there. While most have virtually nothing by our standards, they make their way with determination and good humour." Everywhere Doug and the team went, the people they met were entrepreneurial, hardworking, generous and friendly. He saw a lot more smiles on the streets of Dhaka than he witnesses on the streets of Toronto. Notes Doug, "I think if most of us were dropped into that society, we would have a very difficult time surviving, let alone maintaining a positive attitude." Doug saw the country and met the people in a way that no tourist ever could. He talks about the many, many things he learned on his trip. 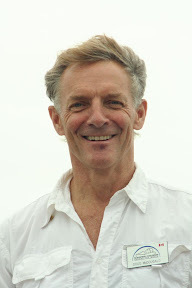 Particularly interesting are his observations about philanthropy and community involvement. In Bangladesh, there’s no public funding for charitable work. It’s all privately funded and service clubs are the delivery vehicles. Without those service clubs, there wouldn’t be any civil sector in the way it exists in North America. He was really impressed by the commitment of service club members: "These were people of the business and professional class who had achieved a certain level of success, representing a very small slice of the total population. But they very clearly invested back in their community, both in terms of time and money. 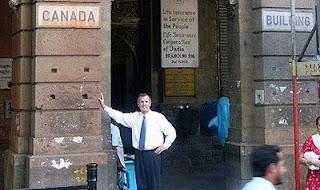 In Canada, people usually work through an organization, but there it was much more direct. Often it involved people going back to their community of origin to do something very personal and direct for the people." When Doug returned home, he couldn’t stop thinking about what he had seen and been a part of in Bangladesh. "It's hard to put this into words," he declares. "It was like a movie playing in my head. I think I was just trying to make sense of everything I had seen and figure out whether we made much of a difference by going there. I've talked with others who have made these trips, and they describe similar reactions." Deep down, Doug knows, though, that he and his team made a difference in the lives of 8,000 kids and their families and he feels good about that. He also has a different perspective on life in developing countries. It’s not surprising, after listening to Doug talk about his Bangladesh experience, to know that he definitely intends to do it again. In 2009, SCAW will reach their millionth child. If you would like to help them toward this goal, visit www.scaw.org. Steven, Rita, Adam & Liana Pinnock are hosting a skating party at the Pine Point Arena in Etobicoke to support Sleeping Children Around the World. You, your friends, and extended family members are invited to our 3rd Annual Christmas Skating party. This year we will be supporting "Sleeping Children Around the World." Click on graphic for a larger version. INTRO: "The holiday season is a time of giving, so if you're planning on making any charitable donations this year, there are a few things you should know. In tonight's Consumer SOS, Sean O'Shea has some advice on how to make sure your donations are getting to the people who need it most." Sleeping Children Around the World is given as an example of a 100% charity — the entire $35 donation goes to the child. Please note though that we don't ship bedkits to the child. The bedkits are assembled by Sleeping Children's overseas partners in the country where they are distributed. For the past twelve years, Jem and Anne Tolnai have been holding an annual Goulash Dinner in their backyard in support of Sleeping Children Around the World. Through their efforts and those of their children, Todd and Taryn (a SCAW travelling volunteer to Kenya in 2006) and her recent husband Doug, they have provided bedkits to hundreds of children and raised the awareness of SCAW far beyond their home area of Orillia, Ontario. Jim cooks the goulash and bakes the bread. Anne spends months baking the pies, cookies, and cakes that fill the first floor of their home on the day of the Goulash Dinner. Thanks to the Tolnai family for their caring and tireless efforts. They're an inspiration to all. It's through efforts such as these that Sleeping Children has been able to help almost one million children. This year marks the last year of their annual event, but Jim and Anne say to watch out next year for their fruit and vegetable stand. Their Goulash Dinners may have ended, but their support of Sleeping Children is going to continue. I bought myself a motorcycle and I have been cruising the country on it. Well, at the beginning of the month I attended the 20th Ontario HOG Rally (Harley Owners Group) in Chatham, Ontario. On the 1st of August there was a Poker Run and one of the card stops was at a barbecue put on by the Kiwanis Club of Ridgetown. On the banner at the back of the tent was marked “Serving The Children of the World.” Upon reading that I went and asked the gentleman serving hotdogs, hamburgers, etc. 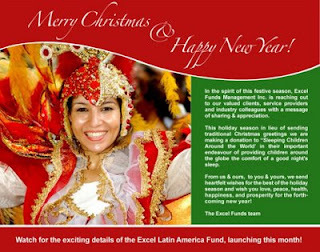 where the money was going and he told me to help in the local community and also to Sleeping Children Around the World. I told him that I was a travelling volunteer and about the trips I had been on. 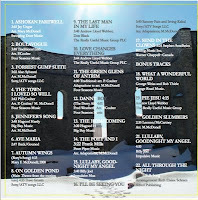 He also told me how his wife gave music lessons and asked a donation for the jar which was to collect funds for SCAW. 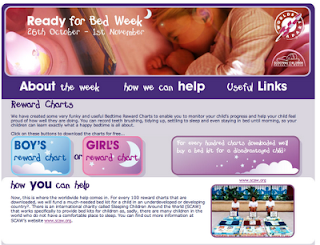 I was pleased to hear of the support for Sleeping Children Around the World. I am including a couple pictures. The gentleman’s name is Gary Wake and he is with the Ridgetown Kiwanis Club. CHARITY - We may know the name Dryden from hockey players Dave and Ken, but two other Drydens created a legacy in 1970 that's continuing to make life better for children worldwide. 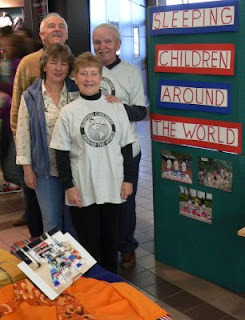 Murray and Margaret Dryden (parents to Dave and Ken) founded Sleeping Children Around the World in the belief that the comfort of a bed is a basic right of every child -- and for them, that translated into bedkits for children living in developing countries. Today, each $30 kit contains items such as treated mosquito nets, covered foam mattresses, sheets, blankets, pillows, towels, school supplies and sandals, ensuring a good night's sleep no matter where the child is. More than $20 million has been raised and 947,850 bedkits have been given out. 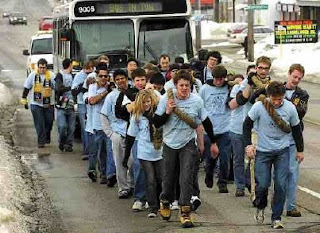 For information about donating or volunteering, go to scaw.org. Sleeping Children a "worthwhile cause"
Click on the link above, or the photo at right to read the blog post. 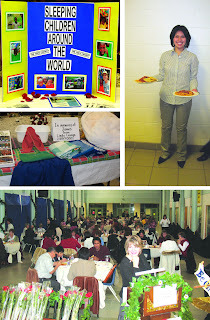 St. Paul's United Church in Oakville held a pancake supper at the beginning of February. 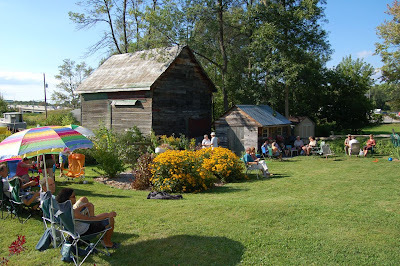 The supper was put on by the children of the Sunday School with proceeds for SCAW. one of the bedkits she helped distribute in Honduras. The air is filled with excitement as the visitors climb out of the two cars, leaving behind thoughts of the rut-filled mud roads that had chattered their teeth for kilometres. About 20 makeshift shanties are scattered before them. The stone and plaster shelters are joined together under terra cotta clay roofs. Curious adults cautiously approach the well-travelled vehicles and their emerging cargo. The hamlet’s children are much more adventurous, joyfully accepting the stickers and flags the visitors offer. One of the visitors to this remote Honduran village sends a flurry of bubbles into the air to their raucous delight. Innisfil’s Suzanne Dobinson is no stranger to facing poverty head on. She knows what an icebreaker the bubbles and toys can be, and she smiles at the cheerful faces of the hosts who are about to be blessed by some very important gifts. There are six visitors altogether from ‘Sleeping Children Around the World’ (SCAW). One is Barrie’s Harry Gauthier. He is, as always, snapping pictures, recording the inspiring events. 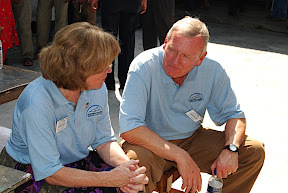 Harry and Suzanne and the others they travelled with aren’t being paid to help distribute 4,500 bed kits to children. In fact, much of the thousands of dollars required to get to and from the remote village came from their own pockets. The visitors are a little surprised to see armed soldiers as they round up the children to receive their bed kits. It turns out they are guarding the wife of Honduran President Manuel Zelaya, who wanted to see what the international aid organization was doing. First Lady Xiomara Castro de Zelaya has her own program to feed and otherwise care for destitute school children. She is impressed with what she learns. SCAW is a registered Canadian charity started by the parents of hockey legend Ken Dryden. Murray Dryden (now deceased) went without benefit of a bed himself during the Great Depression. He knew first hand what it was like having to sleep on the ground. He believed ‘the comfort of a bed is a basic right of every child.’ He and his wife Margaret (also deceased) initially provided bedkits to 50 children in India in 1970. The organization they began flourished, and to date has provided bedkits for more than 800,000 children in 31 countries. The organization helps destitute children get a good night’s sleep to go along with school supplies that come with their ‘bed’. Dobinson says SCAW is a fantastic organization. Every element of each bed kit is purchased in the distribution location in order to improve the local economy, and 100 per cent of donations go towards the kits, she says. All administrative costs are covered by an investment account set up by Murray Dryden. Each bedkit is worth about $30 Canadian. Each contains a small covered mattress, pillow and sheet rolled around a new outfit and supplies including writing and reading materials. “It varies by country depending on what the money in that country will buy,” Dobinson explains. Back in Tegucigalpa (pronounced Teh-gooch-ee-GALP-a), the area’s Rotary Club, made up of Honduran doctors, lawyers and other professionals, helped hand out bedkits to thrilled young students. 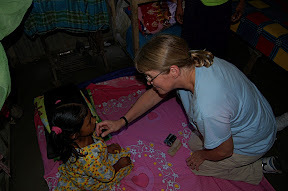 Suzanne assists, making sure to make contact with each child. Dobinson is a holistic healer by trade, and she says the whole effort is physically and mentally healing for everyone involved. One boy, she says, eagerly pitched in with the SCAW volunteers. Dobinson says the money she spent on her trip gave her a great opportunity to see the difference she was making. 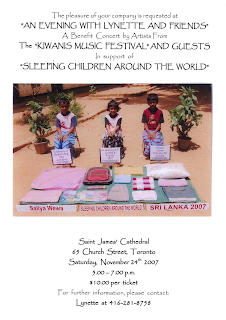 For more information or to buy a bedkit for a child go online , email info@scaw.org or call (416) 231-1841. 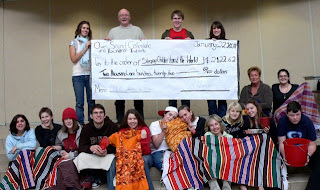 Recently, the Social Justice Committee at Jean Vanier Catholic High School in Collingwood had a fund-raising event which raised $600 for Sleeping Children, enough money to buy 20 bedkits. 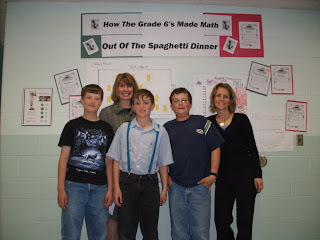 They said: "The dinner was in conjunction with our high school drama production. One of the four charities that we selected to support was SCAW." Staff member Jeannine Murphy provided us with photos of the event. Happy students at Owen Sound Collegiate and Vocational Institute celebrated the end of a successful pre-Christmas campaign in Owen Sound, Ontario this morning. Their campaign goal had been thirty bedkits, but this morning they presented Sleeping Children with a cheque which will buy more than seventy bedkits for children in developing countries. 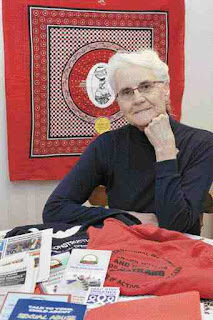 In 2007, SCAW Volunteer Harolyn Panetta received the Ontario Volunteer Service Award, nominated by the Retired Teachers of Ontario, for twenty years of volunteer service in the community, overseas, and especially in developing countries. This was for working with teachers and school principals in Uganda, Ghana and Liberia as a volunteer and as a volunteer tour leader. 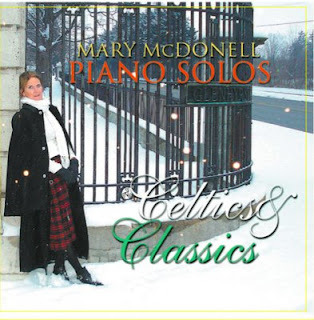 Harolyn has led more than thirty groups of teachers to destinations around the globe: China, India, South Africa, South America, Australia/New Zealand, Europe, the Far East (Thailand, Hong Kong), and one tour around the world. All of this, of course, was volunteer work without one penny in remuneration. She says "It was a real pleasure and I would do it again in a heartbeat." 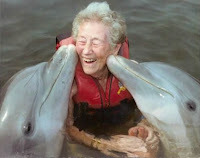 She and her husband celebrated their 50th wedding anniversary this past year. She tells us about how they celebrated: "We thought we would just send in $1500 (50 bedkits at $30 each = $1500) to SCAW. However, we remembered that we had friends who may not know about SCAW so, along with the money, we sent in fifty names with addresses and had the pictures sent to them. Several of these have since sent a bedkit contribution to SCAW to commemorate birthdays, deaths, graduations, and special occasions." A gift that keeps on giving and giving. My Mum, Renee Jarman, was an avid supporter of SCAW, and when she passed away, I wanted to do something special for our organization in her memory. So, I came up with the idea of making a SCAW calendar, with pictures from each of the distribution sites per month. Not just of the bedkits from that country, although they will be a part of it, but individual, personal, pictures of the children. The calendar will be available for the end of this year, for 2009. The launch will be at the SCAW Christmas concert we have at Saint James Cathedral, "An Evening With Lynette and Friends," in November. I just got back from the SCAW offices at 28 Pinehurst Crescent, the former home of the Dryden family which is now the headquarters for Sleeping Children Around the World. Upstairs and downstairs was a beehive of activity as the team going to Kolkata was assembling labels and collecting the computer and camera equipment for the distribution later this month. Then we had a visit from Rob Provencher and James Hodgins and their families. Rob and James (pictured above) are photographers in the Sudbury area who have a successful Web endeavour called NoBS PhotoSuccess and this year they raised money for Sleeping Children Around the World via their Web site again. Last year they asked members of their forums to donate $5 if they so wished, ending up with donations totalling $3,750 ... and then they added $1,000 themselves. 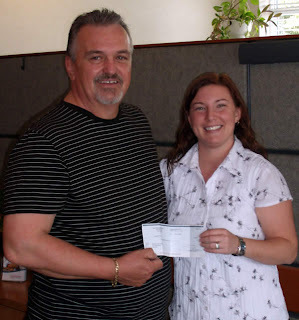 This year they asked their members for $10 to help Sleeping Children and this afternoon came to the house to hand a cheque for $7,000 to SCAW executive director, Linda Webb, and SCAW board chair, Dave Dryden. 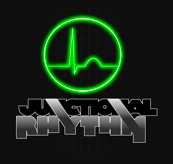 Thanks again, guys ... and give a big hand to all the members of your forums too.